When transferring or constructing real property, taxes are a real concern. However to alleviate this concern, and beneficial to the elderly, in 1978 California enacted Proposition 13. To prevent higher property taxes, Proposition 13 limits increases to a real property’s assessed value whenever the real property goes up in value. 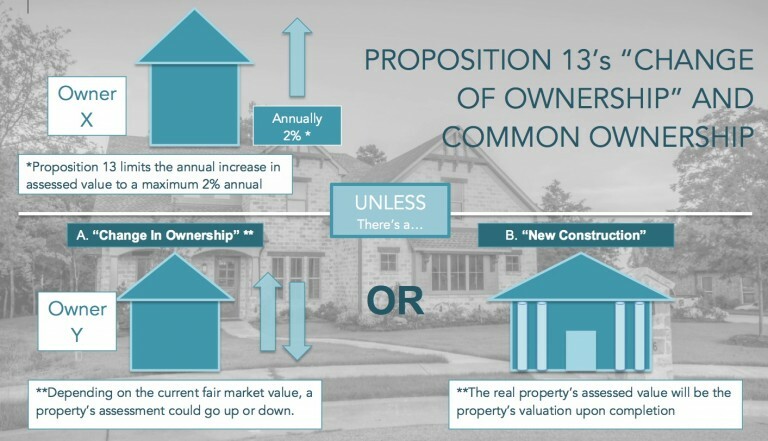 Specifically, in the event real property increases in value, Proposition 13 limits the annual increase in assessed value to a maximum 2% annual inflation factor, except in the event of a “change in ownership” or a “new construction.” Thus, “change in ownership” or “new construction” are key terms to keep in mind. In a change of ownership scenario, depending on the current fair market value, a property’s assessment could go up or down. As for “new construction,” the real property’s assessed value will be the property’s valuation upon completion. Change in Ownership and Common Ownership Under Proposition 13, the purchase of real property establishes a so-called “base year value,” the value to which the maximum 2% annual inflation factor applies to determine property taxes. However, if the same property is later transferred and the transfer is deemed a “change of ownership,” then the base year value would increase or decrease to the current fair market value. This can significantly impact real property taxes. For example, if you purchased a $100,000.00 home 30 years ago and wish to sell it today at the $800,000.00 fair market value, then the base value will switch from $100,000.00 to the new $800,000.00 value. So what does it mean for investors that acquired real property through entities, such as the popular Limited Liability Company (or “LLC”)? Real Property acquired by an entity, such as an LLC, will trigger a change of ownership only if there is a change of control, i.e. a person or another entity acquires more than 50% interest in the entity. For example, if the LLC that acquired the real property is owned by A and B as equal owners, a transfer by A to B of only 1%, would may or may not constitute a change of control, causing a reassessment of the real property. It would depend on if there is an actual change in control. What if co-owners purchased real property individually, but later wish to transfer the real property to an entity? If the real property is co-owned by persons, to avoid a change of ownership it can be transferred to an entity as long as the percentage ownership in the entity is in exactly the same percentages as the property was owned by the co-owners — the so-called “proportionality rule.” Under the proportionality rule, a change of ownership can be triggered either by a change of control (as discussed above), or if, cumulatively, more than a 50% interest in the entity is transferred over time. For example, if A, B, C, and D each own 25% interest in a real property and transfer their interests in the same proportions to an LLC, then there will no change in ownership. However, if A and B each transfer away their 25% interest share, then any subsequent transfer of interest by either C or D will trigger a change of ownership (i.e., commutatively this would be more than a 50% transfer of interest), causing a reassessment of the property. At Schorr Law, our real estate attorneys have extensive experience on various real estate matters regarding the ownership of property and more. For help with your dispute and to see if you qualify for a free 30-minute consultation, contact us by emailing us at info@schorr-law.com, or by calling us at (310) 954-1877.